Armament 12 x 6"/53, 2 x 3"/50AA, 10 x 21" tt. Armor, 3" Belt, 1 1/2" Deck, 1 1/2 Conning Tower. Speed, 35 Knots, Crew 458. Fate: Sold for scrap 27 FEB 1946. 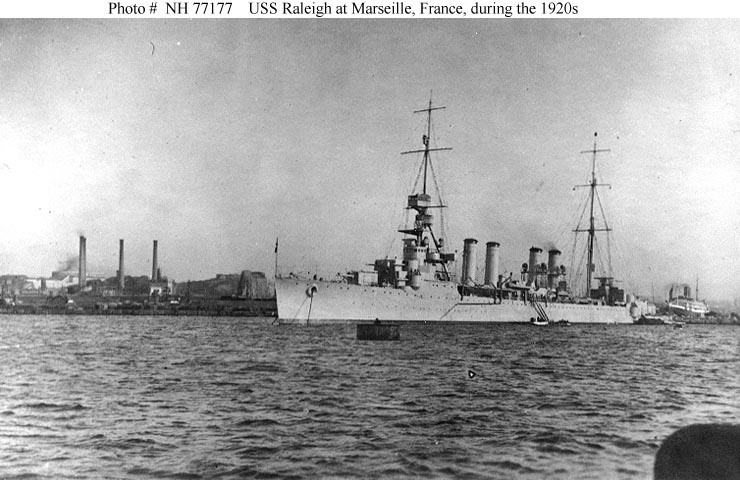 USS Raleigh (CL 7) At Marseille, France, during the 1920s. Courtesy of Donald M. McPherson, 1973. U.S. Naval Historical Center Photograph #NH 77177. 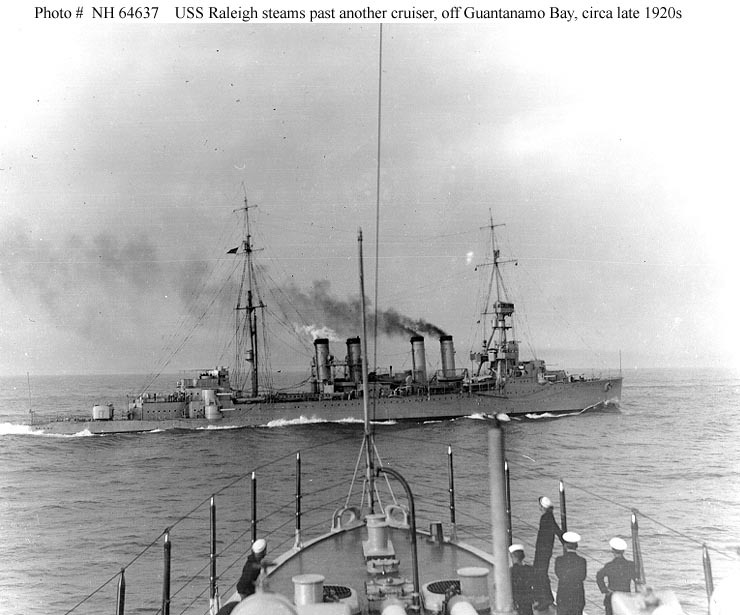 USS Raleigh (CL 7) Steaming past the bow of another light cruiser, off Guantanamo Bay, Cuba, during the later 1920s. Donation of Franklin Moran, 1967. U.S. Naval Historical Center Photograph #NH 64637. 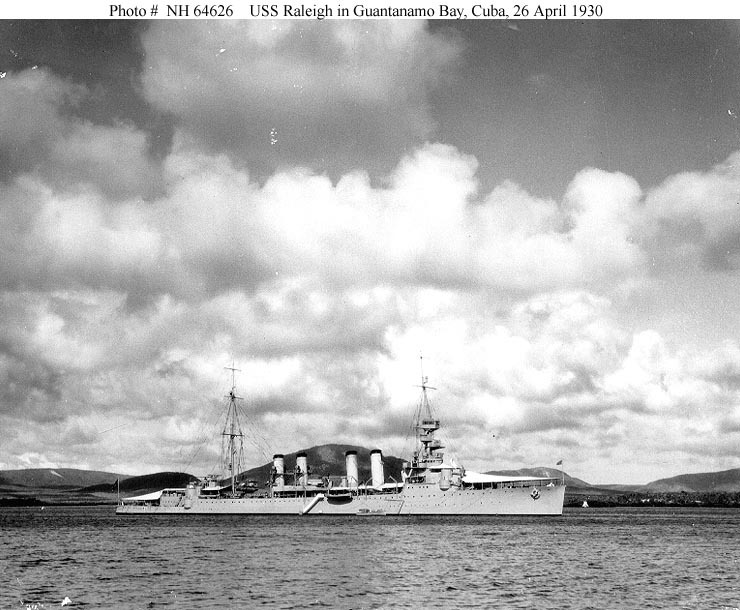 USS Raleigh (CL 7) At anchor in Guantanamo Bay, Cuba, 26 April 1930. Donation of Franklin Moran, 1967. U.S. Naval Historical Center Photograph #NH 64626. 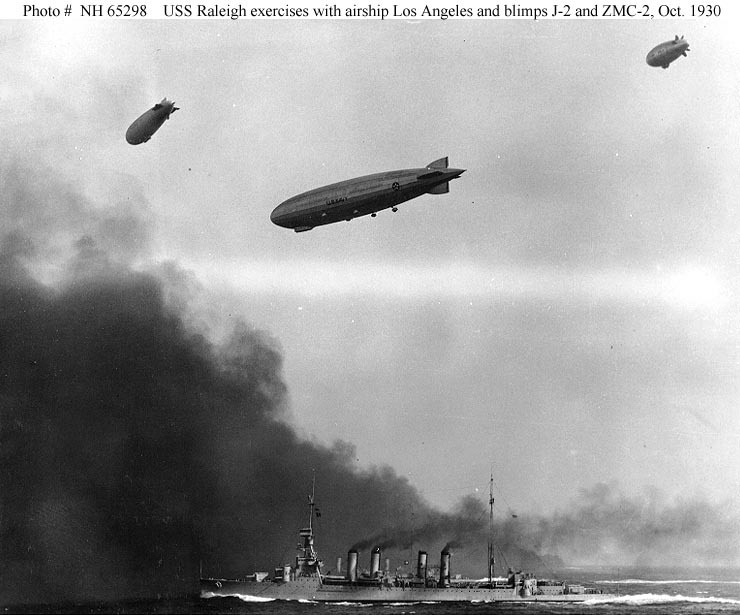 USS Los Angeles (ZR 3) With the Navy blimps J 2 and ZMC 2, flying over USS Raleigh (CL 7) and another light cruiser, during maneuvers off Atlantic City, New Jersey, 11 October 1930. Donation of Franklin Moran, 1967. U.S. Naval Historical Center Photograph #NH 65298. 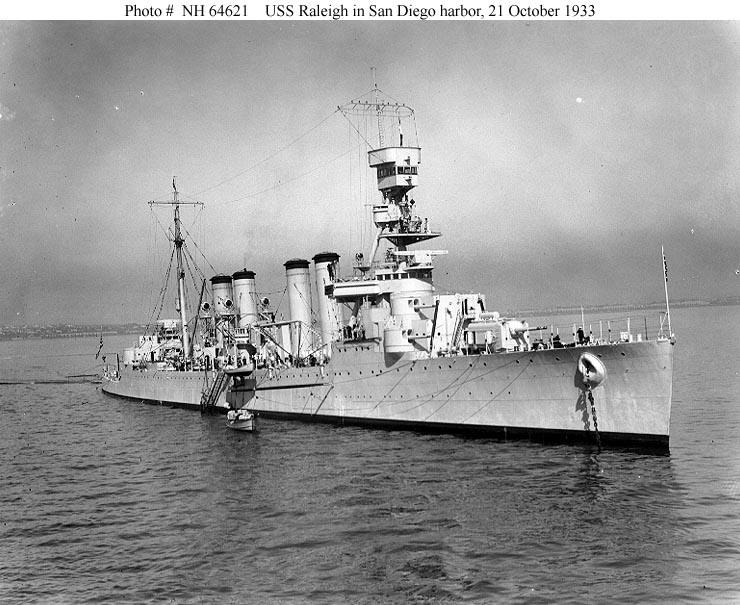 USS Raleigh (CL 7) Anchored in San Diego harbor, California, 21 October 1933. Donation of Franklin Moran, 1967. U.S. Naval Historical Center Photograph #NH 64621. USS William B. Preston (DD 344). USS Chicago (CA 29), Flagship, Cruisers Scouting Force. USS Indianapolis (CA 35), Flagship, Cruisers Scouting Force. 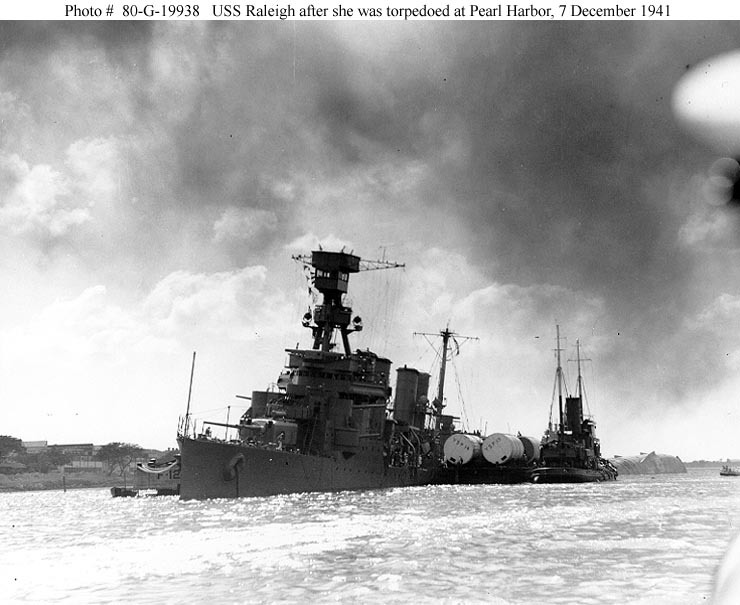 Pearl Harbor Attack, 7 December 1941 - USS Raleigh (CL 7) is kept afloat by a barge lashed alongside, after she was damaged by a Japanese torpedo and a bomb, 7 December 1941. The barge has salvage pontoons YSP-14 and YSP-13 on board. 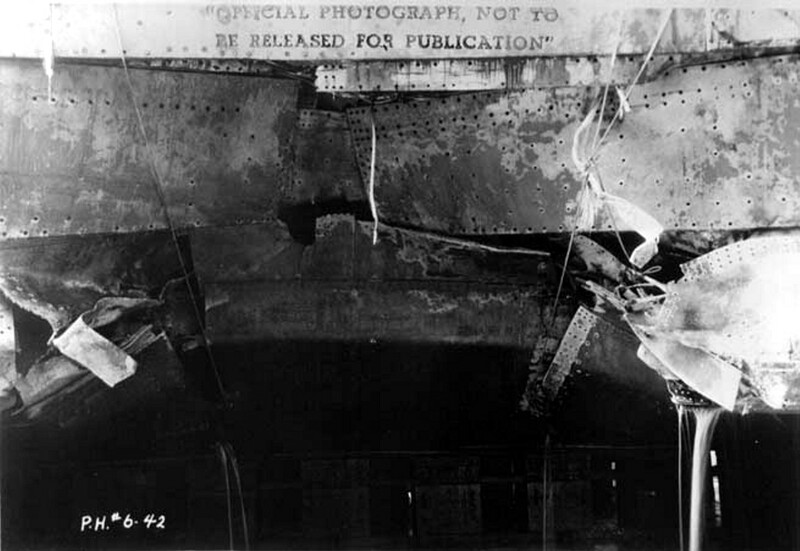 The capsized hull of USS Utah (AG 16) is visible astern of Raleigh. Official U.S. Navy Photograph, now in the collections of the National Archives #80-G-19938. 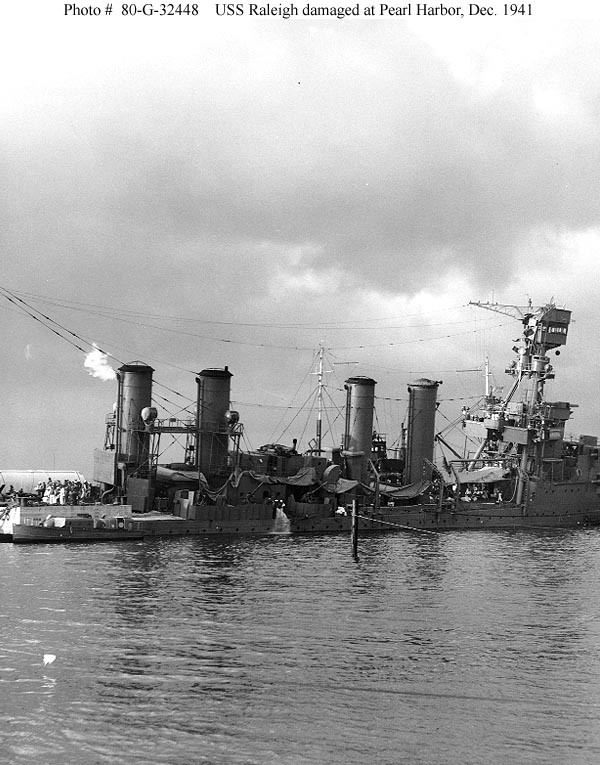 Pearl Harbor Attack, 7 December 1941 - USS Raleigh (CL 7) being kept afloat by a salvage barge moored to her port side, after she had been torpedoed and damaged by a bomb during the Japanese raid. 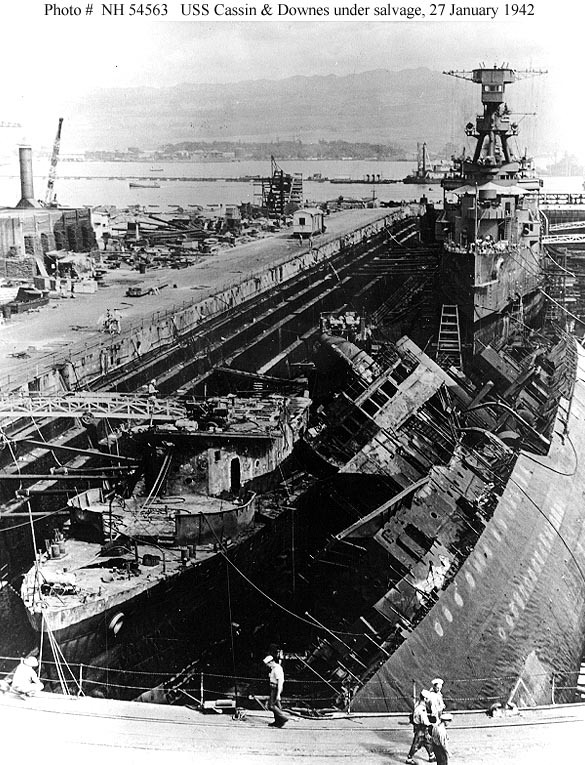 USS Cassin (DD 372), at right, capsized, and USS Downes (DD 375), under salvage in Drydock Number One at the Pearl Harbor Navy Yard, 27 January 1942. They had been wrecked during the 7 December 1941 Japanese air raid. 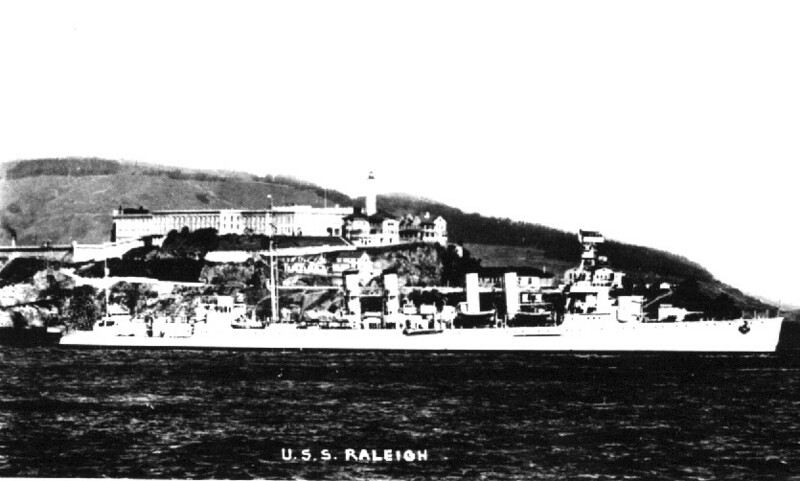 Also in the drydock is USS Raleigh (CL 7), which was under repair for torpedo damage received on 7 December. Official U.S. Navy Photograph, from the collections of the Naval Historical Center #NH 54563. 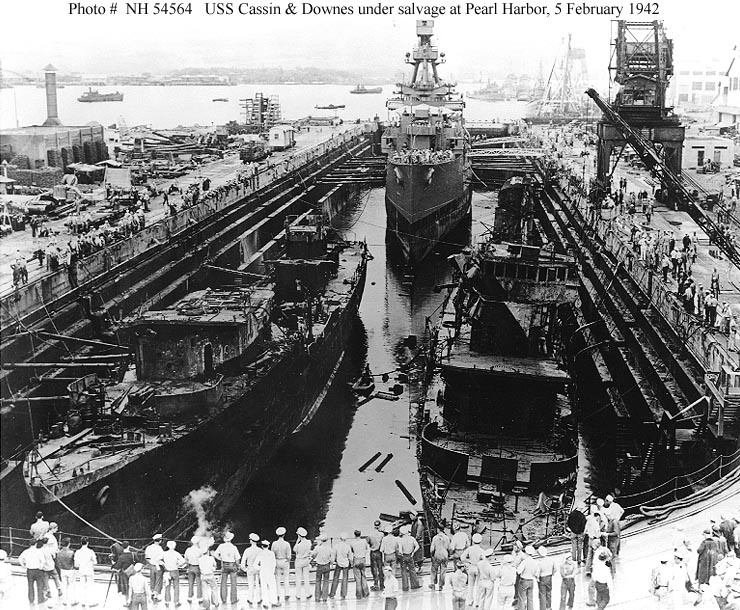 USS Cassin (DD 372), at right, and USS Downes (DD 375), under salvage in Drydock Number One at the Pearl Harbor Navy Yard on 5 February 1942, the day Cassin was righted from her previous position capsized against Downes. They had been wrecked during the 7 December 1941 Japanese air raid. 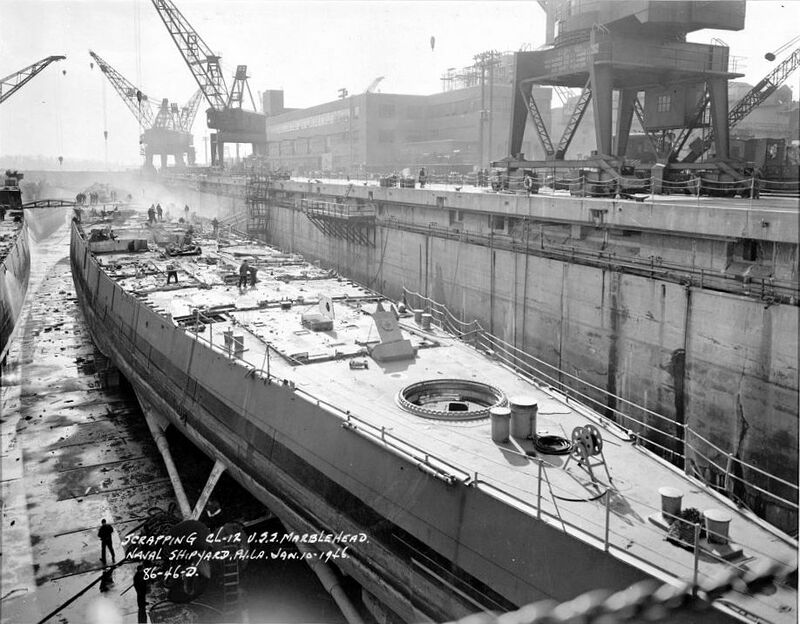 Also in the drydock is USS Raleigh (CL-7), which was under repair for torpedo damage received on 7 December. 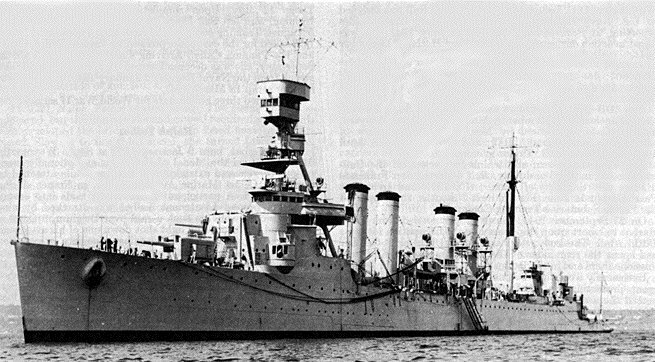 Photo Caption: "Broadside view of damage to Raleigh caused by torpedo explosion between frames 53 and 58 on the port side. Photo taken 3 January 1942." 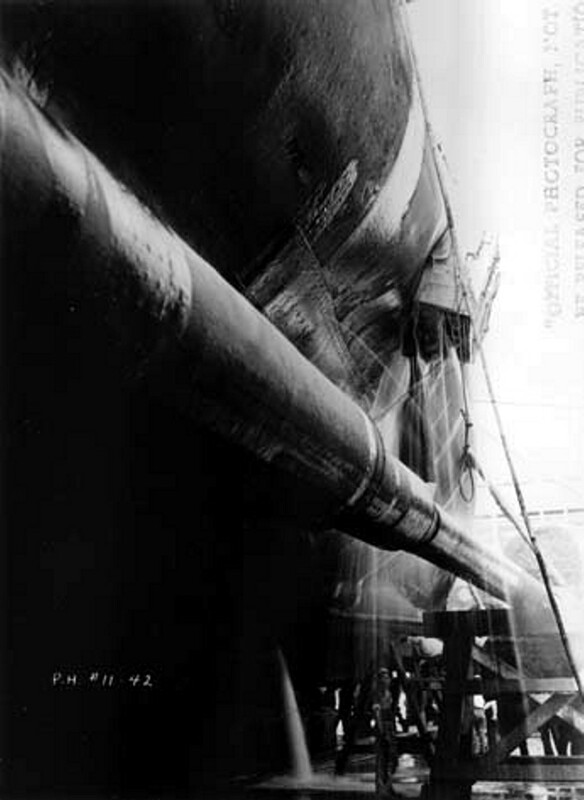 Photo Caption: "View looking along port outboard shaft showing how side of ship is indented due to bomb explosion in water. Exit hole covered by patch is at frame 112." The box in the upper right of the photo is the patch they're referring to. 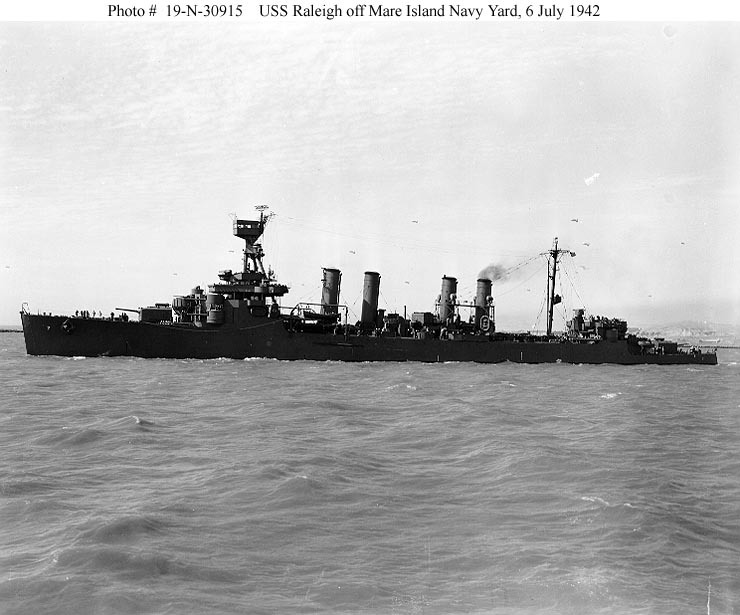 USS Raleigh (CL 7) Off the Mare Island Navy Yard, California, 6 July 1942, following repair of combat damage and an overhaul. Photograph from the Bureau of Ships Collection in the U.S. National Archives #19-N-30915. Photograph from the Bureau of Ships Collection in the U.S. National Archives #19-N-30916. 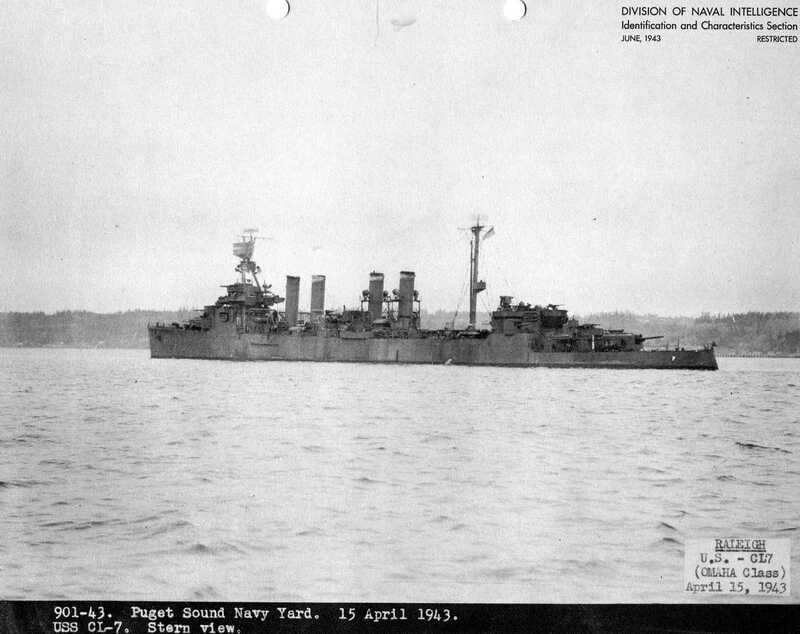 Port quarter view taken at Puget Sound Navy Yard, 15 April 1943. Drawing prepared by the Bureau of Ships for a camouflage scheme intended for light cruisers of the CL-7 class. This plan shows the ship's port side, stern, superstructure ends and exposed decks. It is marked: Approved by E.W. 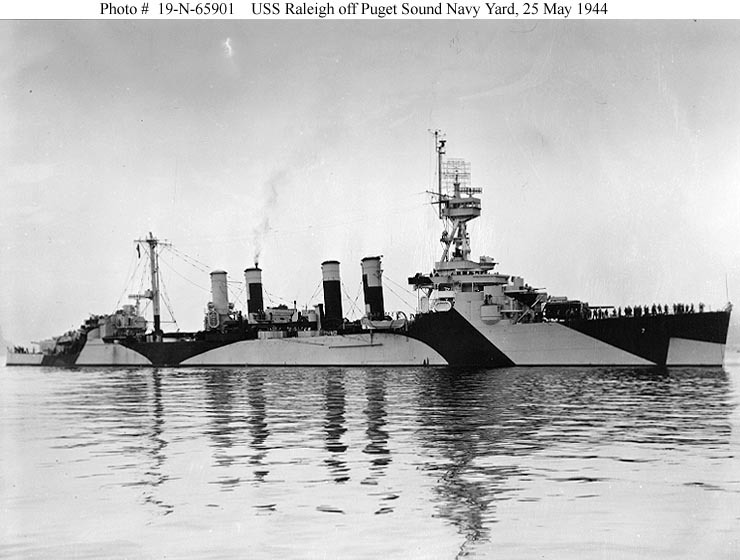 19 August 1943 This pattern was worn by USS Raleigh (CL 7). 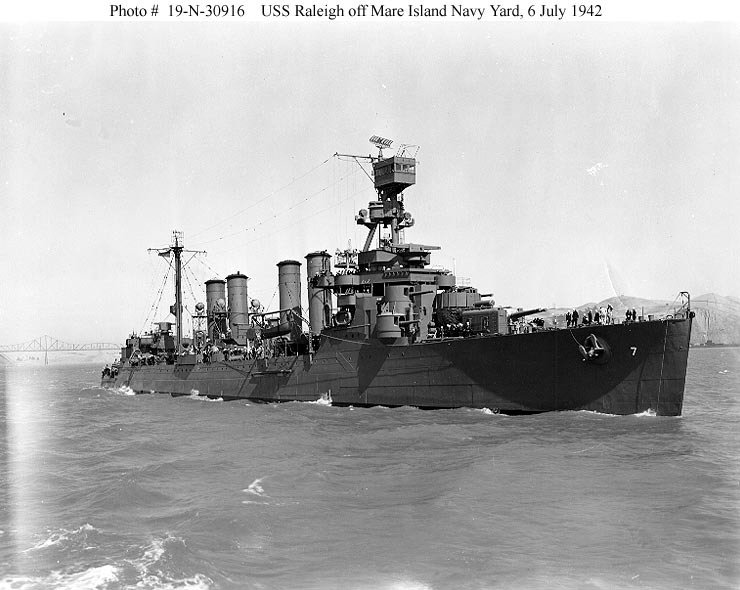 Official U.S. Navy Photograph, now in the collections of the National Archives. Drawing prepared by the Bureau of Ships for a camouflage scheme intended for light cruisers of the CL-7 class. This plan shows the ship's starboard side, stern, superstructure ends and exposed decks. It is marked: Approved by E.W. 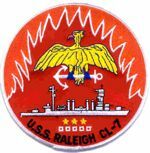 19 August 1943 This pattern was worn by USS Raleigh (CL 7). Official U.S. Navy Photograph, now in the collections of the National Archives. 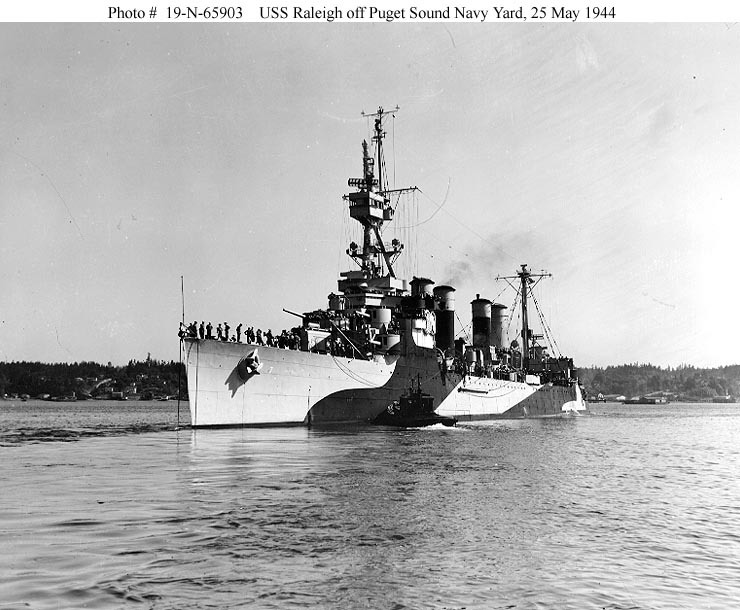 USS Raleigh (CL 7) Off the Puget Sound Navy Yard, Bremerton, Washington, 25 May 1944, following overhaul. The ship is painted in camouflage Measure 32, Design 1d. 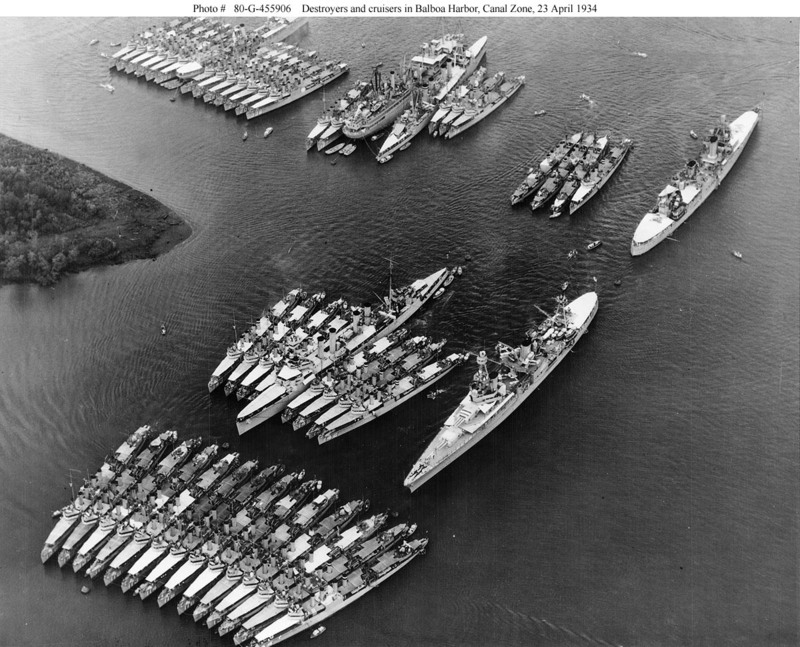 Photograph from the Bureau of Ships Collection in the U.S. National Archives #19-N-65901. Photograph from the Bureau of Ships Collection in the U.S. National Archives #19-N-65903. 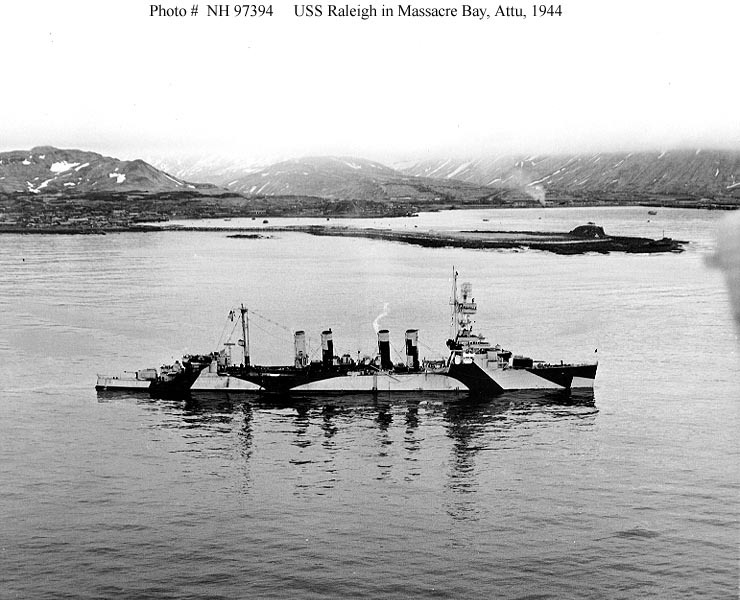 USS Raleigh (CL 7) In Massacre Bay, Attu Island, Aleutians, 6 September 1944. The ship is painted in camouflage Measure 32, Design 1d. Official U.S. Navy Photograph, from the collections of the Naval Historical Center #NH 97394. 0401220 145k Ex-Marblehead (CL 12) being scrapped in Dry Dock No. 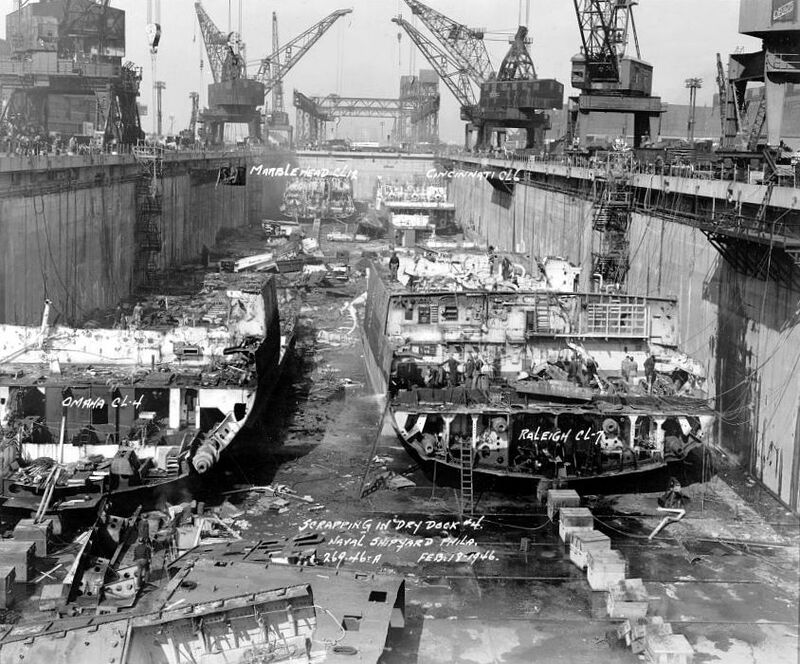 4 at the Philadelphia Navy Yard on January 10, 1946. To the left is ex-Cincinnati (CL 6), behind left is ex-Raleigh (CL 7) and behind right is ex-Omaha (CL 4). This Page Was Created By Paul R. Yarnall And Is Maintained By Tom Bateman.